@SP3CTR3_chelts yeah I actually kind of missed playing him. I ran this sultai deck (with a red splash) when he was legal in standard. It was so much fun. It Prized Amalgam , Haunted Dead , and some graveyard enablers like Vessel of Nascency , Grapple with the Past , and Noose Constrictor . 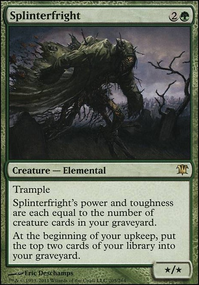 It was pretty consistent at getting a Haunted Dead into the graveyard early, then pitching a Prized Amalgam or two to bring it back during my opponents upkeep, then in response to the ETB trigger on Haunted Dead sac it to Elder Deep-Fiend to tap all their lands down (triggering Sanctum of Ugin and Kozilek's Return when needed) leaving me with amalgams, a spirit, and elder deep-fiend and then repeating the process. Essentially time walking my opponent from turn 4 and on. I'll have to see if I can remember the deck list so I can show it to ya some time. It really was a blast to play. 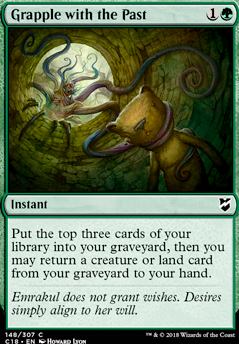 My suggestions are Grim Flayer , because you may select that you put i your graveyard and you can get good draws; Grapple with the Past to grow the graveyard; and I tink that Pernicious Deed can be a good card for this deck, as a mass removal. Hey! I'm really happy to see someone else brewing with the new(er) Sigarda! 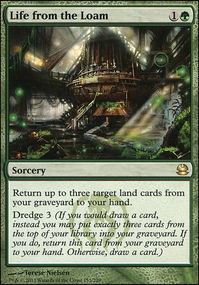 Personally, I think it might help to add a few cards with the Explore mechanic from Ixalan, namely Path of Discovery , which can let the tokens Sigarda makes refuel your grave, smooth your draws, and give you a little more power. 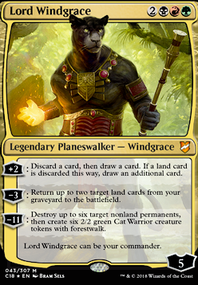 I'd also try to find a space for Ray of Revelation and Purify the Grave , which are useful even if you mill them, but can also be exiled by Sigarda if you don't need them. 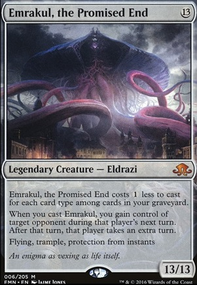 Eternal Scourge would be a cool addition, since you can play it, chump, exile to Sigarda, and then recast it from exile. Other in-block support could be Crawling Sensation , which gives you the option to mill each of your upkeeps. 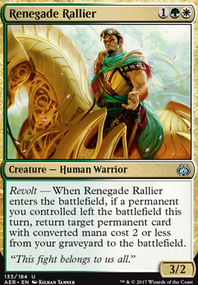 This card would also work great with fetches, which are also extra fuel for your general! If you're considering Regrowth , I'd also recommend Grapple with the Past . It's a bit more restricted, but it fuels Sigarda and it's an instant. Happy brewing!